End of Advent greetings and graces. Merry Christmas! May your days be filled with prayer, and holy and happy times. I’d like to share a story that is nearly a miracle. If not miraculous – it’s a holy and tender experience that has to do with visiting seniors. Would that I could tell you about each of the seniors I regularly take Communion to or just visit with each Thursday morning after Mass. There are two quadriplegics — one a Native American who fell to the ground while working on a roof. He is a very happy man (it seems to me). He has very limited use of hands — but he tells me he is thankful to God for the progress he’s made since the initial days after his accident. He can now do some limited functions (such as email) using a tablet computer. He’s also able to use a special cell phone and call his mom and talk to family members. He told me they have something like 48 head of cattle on the family ranch — and all of them are pregnant. God willing, next spring, they will have 96 head of cattle. He smiled when he shared that news. The other quadriplegic is a woman and she, too seems so happy. She can’t speak and only makes grunting sounds — but she is always smiling. Those of us walking and talking are all given an extra dose of gratitude when seeing how joyful this woman is, given her condition. Well – let me move on to the main part of this reflection. There is another Native American that I have visited for perhaps a year or slightly more. Unlike some I minister to – Joe is pretty coherent most all the time. Joe has had both legs amputated about mid thigh and he’s confined to a wheel chair. During my Communion visits with him, he’s talked about serving in the army in the great battles in the fall of 1942 at Guadalcanal. Joe has lost a lot of buddies and he’s seen the horrors of war. I don’t know but what those experiences haven’t had something to do with what I’m going to share with you in a few seconds. I remember one woman who outright told me that she hadn’t been going to Church for many years. And when I asked her if she wanted to see the priest for Confession – she told me she didn’t ‘believe in that stuff.’ She said she could take care of this matter by herself. Translated: I confess to God directly. Though she claimed Catholicism, I had to tell her that she wasn’t practicing THE CATHOLIC FAITH. She just ignored what I was sharing and, of course, I wouldn’t give her Holy Communion. Back to Joe – one of the survivors of Guadalcanal. I must have asked him four times if he’d like to see the priest. He always said no — that he was okay… But he did want to receive the Eucharist. Mine isn’t to second-guess. So I have been giving him Communion all this time. And before I could say the Lamb of God for him — he started to confess his sins to me. It took seconds to realize what was happening — by then, he’s more than half way into this confession. He’s looking me directly in the eye and we are very close to each other. You know that a deacon can’t hear confessions… although I’ve often joked that I hear them from time to time – I just can’t do anything about forgiveness. 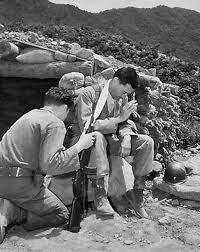 Today — in a singular moment of grace — I believe the Lord Jesus let me be a ‘priest’ for this military hero. I just know that I prayed for the forgiveness of Joe’s sins. And I’ll still be praying for Joe for quite a while. Joe gave me a Christmas gift that will stay with me the rest of my days. He didn’t say any of the formal words (Bless me Father, for I have sinned….) – but there was no mistaking the tender beauty of that moment. And Holy Scripture does say to confess your sins to one another in the Church. Yes, I know we don’t do it the way that it happened. Special circumstance. Have you ever heard the confession of someone? What a beautiful, grace-filled experience. I’m sure priests get tired of hearing things (e.g. “I got angry with my husband four times, and I lied twice….”). I wish a priest would read this and it would refresh him in the importance of being there for sinners. Sinners like me and Joe. « CF159: Mine Is Bigger!